As you might already know, this blog was set up to help me dress myself. I was the least fashionable person in the world and was fed up of wearing tea dresses and leggings in a mild attempt to fit in. I now relish the fact I own neither, and am (fairly) confident that everything in my wardrobe is a) necessary, and b) well fitted. I started the essentials series in 2013, but got a little sidetracked. So, as I'm having my annual wardrobe clearout I thought I'd share my logic on how to keep a lean + well worn capsule wardrobe. Starting with coats. I love coats, I used to own tens of them. But I often found many went unworn, despite them being from a decent store and decided to crack down on what I really need. I created this list, and thought I'd share the rational. The Fash Pack Favourite - aka, the camel coloured coat. I live in mine, and drone on about them all the time (Don't believe me, check out the pinterest board homage...). There is a very simple reason this style is a favourite with the fashion world: it goes with everything. When editors pack for shows, they have limited space. I challenge you to give me a trend or colour that doesn't go with. I bought mine 5 years ago in the Whistles sale, this one is from Joseph. The Work Appropriate - No matter what you do for a living, there will always be a time where you'll need a simple plain coloured (black/grey) coat. Even the most flamboyant careers need one - for formal meetings, interviews... Pick one that fits you, check the shoulders mirror your shape, and invest in it. The higher the wool count, the better. Basically, if you can machine wash it it isn't good enough quality. You don't have to spend the earth, this one is £90 from Mango. The Showstopper - this is the one you'll probably chop-and-change a little bit more as it's more seasonal/trend focussed than the rest, so spend less - Topshop always do great ones for around £75. I chose this neon J Crew number. This coat should be a suitable shape to go with formal and weekend outfits, as you'll need it for both. It also needs to be light enough for spring and winter. You'll wear it when you want to perk yourself up a little bit, pairing with your basic tops, jeans + shoes. The Leather Biker Jacket - Another favourite with the muses and models of the world, the leather biker is something you just have to own. For me, there really only is one place to buy them - Whistles. You could go and drop £1,000 in Burberry, but for a quarter of that price Whistles will sort you out. Pair them with your jeans and tees at weekend, or (personal fave) mix it up with contrasting girly skirts and dresses. You won't regret it. The Spot On Leopard Coat - It took me a while to agree with people on this, I first thought this was a short-trend. But no, the leopard print coat is still a fashion staple for many. The whole point of this is that it is snug but smart, so pick one that fits and don't buy one that's too yellow or orangey in colour as they look so cheap. This Sea NY one is a good version. 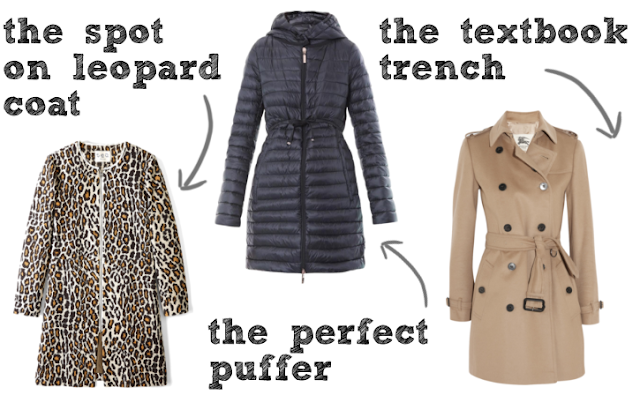 The Textbook Trench - Maybe it's the Brit in me, but I think a trench coat is an absolute must. Perfect for weekends (smart but not too smart). It's also ideal for British weather, as it's light for Spring but does keep you warm. I'm a total snob with them, I do think you should buy a Burberry one and no other. Banana Republic do a good second option, but it's all about the Burberry. They are expensive, but check out vintage stores, second hand sites (like Vestiaire) and charity shops for good ones. So, there you go. The 7 essential coats, in my humble opinion. I've chucked out so many now and make sure I get my remaining ones dry cleaned every year. I bought a rail and some clothes bags to keep them on in the loft when I'm not wearing them, they really are worth looking after. What do you think of my choices, any I've left out? Yes the Camel is such a great investment however there doesn't seem to be one on the high street at the moment that isn't too boxy! I'm praying for Whistles to bring out their Lux Overcoat in Camel! I got myself a Barbour puffer the other day, after returning from New York and kicking myself for not biting the bullet and getting a Canada Goose. I do not regret it. It's the only way I will leave my home at the moment! There really is nothing more important than a coat in an outfit, unless it's shoes. I think it's the first thing people notice. For me, the leopard print one is a fave, it looks so stylish! 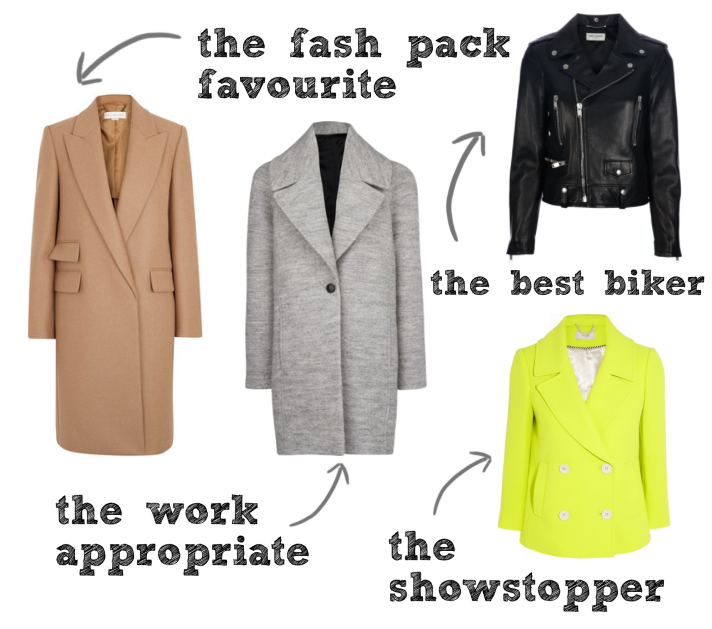 Jackets and especially coats are something you can´t have enough of :D I love the "work appropriate" coat a lot because the cut is so clean and cool! Also so funny you discovered my blog via Thankfifi! Glad you made it to my site :) Your blog is pretty cool as well, I love your header a lot!